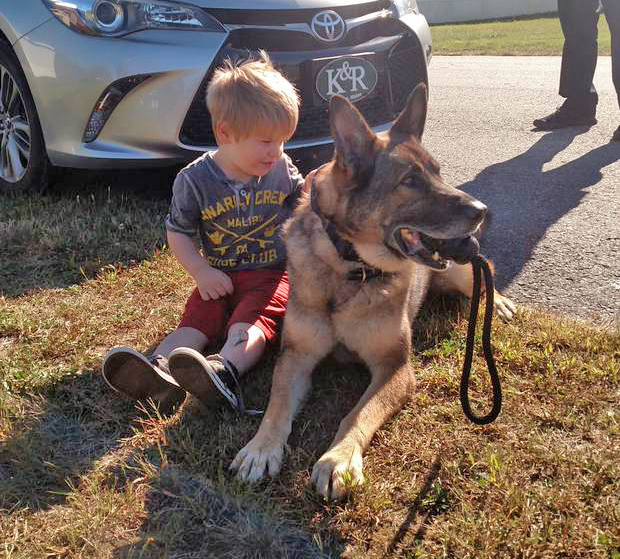 Lewiston police tracking dog Ice relaxes with the 3-year-old boy he helped track down on Thursday. The boy was found unharmed in a nearby brook. LEWISTON — A Lewiston police officer and his tracking dog on Thursday were credited with finding a young autistic boy who had wandered away from his home. The 3-year-old boy was found chest deep in the water of a brook, according to the Maine Police Canine Association. It happened at about 2:15 p.m. when police were sent out to the area around Heather Avenue, off Stetson Road, for a report of a child who had wandered away. Officer Nate Hood responded to the area with his dog, Ice. Ice began tracking across a field near the home, according to the report, and into the woods. Once in the woods, Ice continued tracking down a small trail along the edge of a swamp where he began to pick up a scent, indicating to Hood that the boy was nearby.